Pranay Dev, hails from Hyderabad, India. His love for Psychedelic Trance music developed in the year 2001, after attending various Psytrance parties, all over. The music captivated his mind so much, that he decided to take things in his own hands and started mixing and producing music. He has been playing since the year 2006. He operates under the moniker ‘Dev’ for, Kamino Records. His style of music is fast-paced and his variations are splendid and includes melodies, that might seem haunting yet appealing at the same time. His style is dark, abstract and experimental. The speed of his music goes on from 170 bpm-200 bpm. He has been playing at various parties all across India. Few artists who continue to influence him are, Penta , Derango, Grapes of Wrath, Kindzadza, Kashyyyk, etc. 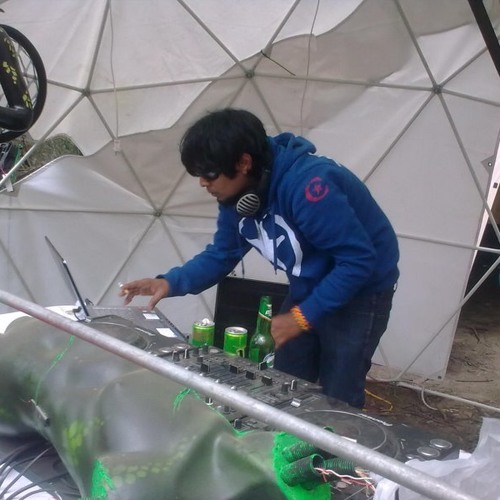 Pranay, also initiates various Psychedelic Trance festivals, providing a platform to many International and home-grown artists, to showcase their musical skills. Dev’s talent is incredibly amazing. This guy can make you thump all along on the dance floor. His creative mixing skills, brings about a crazy energy in the crowd. His commitment to his music, encapsulates that which makes the psy-dance culture, life-changingly thrilling. The crowd, tends to instantaneously and truthfully, react to his music. He is one of the scant few DJ’s who is pushing things forward. He understands that the best, psychedelic trance music, moves both the heart and feet. He is permanently cemented into the foundations, of Dark Psychedelic Trance. ‘Dev’ is a mesmerizing presence and an unmistakable spectacle in this scene.